The Yeomen of the Guard, or The Merryman and his Maid, premièred in 1888, with music by Arthur Sullivan and libretto by W. S. Gilbert (http://en NULL.wikipedia NULL.org/wiki/W NULL._S NULL._Gilbert). The operetta takes place in the Tower of London during the reign of King Henry VIII. At the start, the gentleman Colonel Fairfax is wrongly accused of sorcery and sentenced to death within the hour. Fairfax hatches a plan to avoid letting his estate fall into the hands of his scheming cousin (incidentally, his accuser) by secretly marrying Elsie Maynard, a strolling singer. 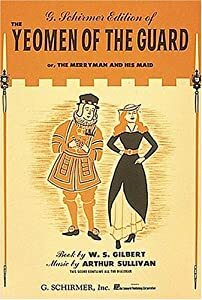 She agrees to be blindfolded during the ceremony and expects to be a wealthy widow upon Fairfax’s imminent demise, leaving her free to marry her lover, the jester Jack Point. However, Fairfax miraculously escapes his fate and chaos ensues.